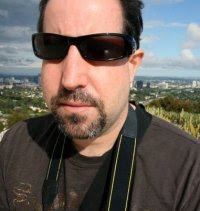 My Israeli friend Danny from Sony and I saw The Bourne Ultimatum today. 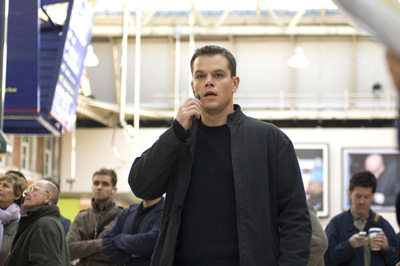 Jason Bourne sends signals to a targeted journalist, in hopes of navigating him to safety outside the Waterloo train station. Plotwise, this movie is about signals. The CIA sends signals to an "asset" (i.e. assassin) to hit targets. A CIA team searches for relevant signals that might reveal Bourne's location, be they cel phone messages, GPS coordinates of phones, trips taken, passports stamped, or visual clues from security video feeds. Meanwhile, Bourne sends false signals, even spoofing signals on behalf of CIA folks, using old passports, giving false meet-up locations, and doing his best to avoid sending overt signals of any sort. He also sends signals in specific languages, like when he calls the Spanish police as an obstacle against encroaching CIA gunmen. Visually, this movie is about whiplash. Unsteady camera moves, insanely fast fighting choreography and editing, cars and motorbikes racing through skinny Moroccan and congested New York streets, all coming to rapid, neck-wrenching smashes against walls. Well, neck-wrenching for everyone except Bourne, who had some pretty amazing training it seems. He can survive 10-story falls into water, 60+mph car crash impacts, cel phone-triggered explosives less than 10 feet away... Hell, he can even get a brand new mobile phone activated in minutes! But overall, I thought the movie was tight -- most of the signals were clever, made sense, were well-motivated and didn't come from out of nowhere. In this surveillance world we live in, it's time we got used to having all our signals captured and potentially scrutinized (done East German Stasi-style gone high-tech). We need heroes like Bourne to remind us that fighting for privacy is a good thing, dammit!